Perhaps the on big news release today was found on Digital Music News. They note that after a couple years of litigation, UMG settled for a $15 million dollar payment with an additional 1,360,544 shares of GEE stock. Some 4,500 songs were allegedly infringed as well as videos. Earlier, we estimated that worst case, the deal could hit GEE with a deal worth hundreds of millions, however, we now have a settlement with the lawsuit dismissal and no admission of guilt or liability. Actually, GEE will survive this story and we think they will continue to do well. We also note that GEE’s PR folks did not respond to our request for information (no surprise). Here is the whole story. And here is another link with a different spin. Panasonic Avionics (Panasonic) and Yahsat today announced the signing of a Memorandum of Understanding (MOU) to explore new ways to offer a broadband connectivity solution serving several mobility markets in the Middle East within the next three to five years. In addition, while final terms are still being negotiated, the MOU allows both parties to further investigate the launch of a Yahsat satellite constellation that would serve Panasonic’s general mobility needs in aviation, maritime and terrestrial transportation, and also give Yahsat the ability to use Panasonic communication related technologies and services where practical. Moving forward, Yahsat and Panasonic will assess the various technical requirements for such an offering. The companies will explore a wide range of factors including the type of frequency to be used, the coverage and capacity needed to serve flight routes in this region, the type of antenna and radome to be used, and the certification requirements of such a solution. In addition to the previous news story, Virgin Atlantic builds on in-flight entertainment innovation by adding live TV to 787s. Customers travelling with Virgin Atlantic this summer will now be able to tune in to live television onboard its 787’s, thanks to a partnership with Panasonic Avionics and IMG. This new service will be available to customers travelling on the state-of-the-art Boeing 787 Dreamliner and initially three channels will be available – Sport 24 for all the live sporting action from around the world, and BBC World News and CNN International for breaking news around the clock. Sport 24 will be showing action from the Rio 2016 Olympics Games, Premier League, NFL, UEFA Champions League, NBA, Tennis Grand Slams, Bundesliga, Formula 1, Golf Majors, MotoGP, and the Ryder Cup. 1. Wi-Fi is the Premium Service Travelers Demand. Lack of in-flight Wi-Fi has become intolerable as passengers shared they’d be disappointed or frustrated without access to this service. 2. Wi-Fi Should Be Like Breathing. Simple, Reliable and Not Something Travelers’ Worry About. 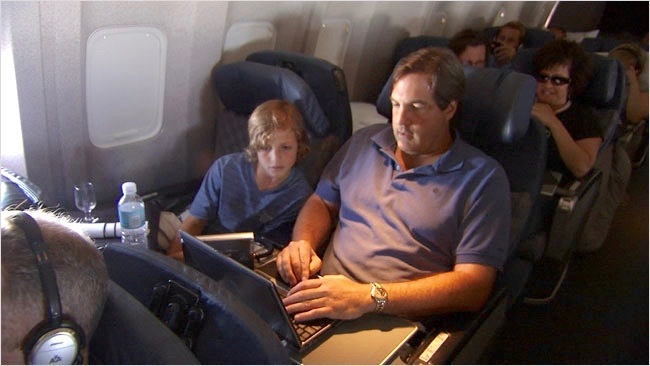 Reliable connections on flights anywhere in the world and fast speed to stream audio or video to sites like YouTube or Netflix are essential to passengers’ Wi-Fi experience. 3. Millennials Mean Business When it Comes to Wi-Fi. More millennials than older generations have switched from their preferred airline to an airline that has better in-flight Wi-Fi options. Here is how the study unfolded: A survey of airline passengers by Honeywell (NYSE: HON) reveals more than increased frustration with current in-flight Wi-Fi offerings compared with the company’s 2014 study. Nearly 3 of 4 passengers are ready to switch airlines today to have access to a faster and more reliable Wi-Fi connection. In addition, out of more than 1,000 American travelers polled, annoyance is growing, with just 22 percent reporting their in-flight Wi-Fi to be extremely reliable over the past 12 months, a dip from 27 percent in 2014. If you don’t want to sort out their findings, the following is a summary: 1. Traveler Loyalty Lies With Wi-Fi, 2. Consistent Connections Are Critical Everywhere, 3. Millennials Value Wi-Fi More Than Most. IFExpress really found some results interesting enough to ask a few more questions of Honeywell’s Gwennie Chung. 1. We would like to know more about the questionnaire? ANS: The Honeywell Aerospace Connectivity 2016 Survey was conducted between April 11th and April 20th, 2016 among 1,008 Americans ages 18 and over who have used in-flight Wi-Fi in the last 12 months. 2. Where were they interviewed – on-line, mail? ANS: Using an e-mail invitation and an online survey. 2. Are you talking about working Millennials or any other factors? ANS: In this survey, Millennials are (travelers) born between 1982 and 1998. 3. Was travel price/cost involved. If not, why not? ANS: Yes, we did have a question on pricing but the way it was framed, we find that it may not be relevant/accurate relative to the current landscape and decided not to use this data. 4. Domestic vs International connectivity preferences? I realize that was when planes had props, however, I would be interested in today’s preference order. ANS: We did not have this ranking. 7. Did you get any results for old timers (like me)? ANS: We did compare Millennials to older generations. More millennials than older generations (73 percent versus 63 percent) say Wi-Fi availability impacts the flights they book. Because they value a connected experience more than older generations, more millennials find it important to have fast speed to stream content (89 percent versus 77 percent), and more than 1 in 4 have switched from their preferred airline to an airline with better in-flight Wi-Fi options (27 percent versus 15 percent). 8. Can you get any validation of the required bandwidth for a full plane of connectivity mavens… I am trying to figure out how much is “enough”! ANS: Most travelers find it essential to experience a reliable connection throughout their entire flight anywhere in the world (90 percent), and one that is fast enough to stream audio or video from sites such as YouTube and Netflix (83 percent). We don’t have any information to share on this as there are too many variables. a variable pricing as a solution – “The more you pay, the more you get”? ANS: No, we did not. 10. So here is the bottom line: Will people change airlines, regardless of flight or connectivity cost, just to have Internet? Gogo is announcing that they have received regulatory approval from various Chinese regulatory bodies through their local partner China Telecom Satellite, and will work with China Telecom Satellite to offer in-flight connectivity service on international flights operating in and out of China starting in October. “This is really a ground-breaking moment as we expand our global reach as an organization into China and other parts of the world. For passengers on Gogo equipped flights currently flying into China, this means they will be able to enjoy seamless service once they reach Chinese air space,” said Gogo’s president and CEO, Michael Small. “We believe China Telecom Satellite will be a very strong and effective partner for China’s in-flight communication market and both parties will extend the cooperation to Chinese airlines in the future.” We also note, Gogo currently has one International airline partner operating with service to China, and recently announced it has signed a term sheet with Beijing based Shareco Technologies to install its 2Ku in-flight connectivity technology on 50 commercial aircraft for Shareco’s airline partners, including Hainan Airlines and Beijing Capital Airlines. In addition to in-flight connectivity, Gogo will also provide its wireless in-flight entertainment solution – Gogo Vision – for Shareco to install on these aircraft. Noted Michael Small: “For passengers, this means on Gogo equipped flights currently flying into China, they will be able to enjoy seamless service once they reach Chinese air space.” You can read more about this partnership on here on Concourse. United Kingdom | August 11, 2016– Customers travelling with Virgin Atlantic this summer will now be able to tune in to live television onboard its 787’s, thanks to a partnership with Panasonic Avionics and IMG. This new service will be available to customers travelling on the state-of-the-art Boeing 787 Dreamliner and initially three channels will be available – Sport 24 for all the live sporting action from around the world, and BBC World News and CNN International for breaking news around the clock. Virgin Atlantic customers will be able to tune in to live TV via their seat-back screen or via their own devices using the onboard wifi, at no extra cost. The service is being rolled out to the 787 Dreamliners now, and all thirteen aircraft will be fully equipped by the end of the year. In 1991 Virgin Atlantic was the first airline to introduce individual seat back screens in all classes, and by Summer 2017 will offer wifi connectivity across all its aircraft. Farnborough, UK | July 11, 2016– UK based Virgin Atlantic Airways has selected the A350-1000, the largest member of the A350 Family, to become the latest aircraft in its fleet, operating from both London Heathrow and Gatwick airports. The airline is purchasing eight A350-1000s for deliveries commencing in 2019, and four new aircraft on long term leases from ALC from 2020, including a lease “option” for a fifth aircraft. The A350-1000 was selected after intense and detailed evaluation of the current and future alternatives. The airline will benefit from state-of-the-art technology and the latest cabin product innovations to satisfy the most exacting customer expectations. Airport operations and neighbouring communities will benefit from the use of an environmentally efficient aircraft with low pollution credentials and half the noise impact compared to rival aircraft. The aircraft will be deployed initially at London Heathrow to strengthen the trans-Atlantic network on existing business routes, and subsequently at Gatwick airport on leisure routes to the Caribbean, where Virgin Atlantic will provide three classes of customer service in the A350s distinctive Airbus ‘Airspace’ cabin with roomy overhead bins and the latest concepts for ambience, comfort, service and design. The world’s latest generation airliner, the A350 XWB, is the newest member of Airbus’ modern, comfortable & efficient widebody product family with 18” wide seating in economy. The long-range A350 XWB features the latest aerodynamic design, carbon fibre fuselage and wings for a lighter aircraft and quiet and low emission Rolls-Royce Trent XWB engines that together deliver a 25 per cent reduction in fuel burn. Together, these technologies translate into unrivalled levels of operational efficiency, with, lower environmental charges, and significantly reduced maintenance costs. Virgin Atlantic’s first Boeing 787 aircraft, Birthday Girl takes to the skies today, flying from London to Atlanta on a special celebration flight. London, UK | October 23, 2014– Guests on board include BRIT Award-winning 4-piece Rudimental and hit-makers Gorgon City. The two London based bands will perform the first ever gig to be live streamed from over the Atlantic Ocean to the world and a plane packed full of VIP guests and an exclusive audience of super fans who won spaces on the flight. Also on board is TV chef Lorraine Pascale. Best known for her hit TV series and recipe books, Lorraine has been working with the team at the airline to create signature dishes for Virgin Atlantic’s Upper Class passengers along with a variety of children’s meals to be served throughout every cabin. Dishes on-board will include Lorraine’s “Marvellous” mac’n’cheese with pancetta, Sweet & sour pork balls with sunshine rice and “Mum’s” chili con carne with calypso rice. Lorraine’s new menu will be officially launched on services leaving the UK from 28th October but as a special one-off all guests on board the celebration flight to Atlanta will have the chance to experience her new dishes in every cabin. To accompany Lorraine’s amazing food and making a special appearance on board for the first time is Virgin Atlantic’s new sparkling wine from English winery Hambledon Vineyard. Proudly grown and produced in Hampshire, Meon Hill Grand Reserve has been specifically selected to compliment the cabin pressure and humidity of the 787 cabin and has been found to stay bubbly for longer. The new sparkling wine will be launched on Birthday Girl and will be available exclusively on the 787 aircraft. Birthday Girl will start her first commercial flight on 28th October to Boston and other Dreamliners will be deployed on other key London to US East Coast market initially, with subsequent services between Heathrow and Washington, Heathrow and Newark and Heathrow and New York JFK scheduled to start in the following five months. London, UK | October 23, 2014– With a suite of new technologies onboard, the first Virgin Atlantic 787 Dreamliner will take to the skies on 26th October from London Heathrow to Boston. As one of the most efficient aircraft in its class, a key to its performance is its new technology and innovative design. Virgin Atlantic has teamed up with Panasonic and T-Mobile to offer all customers eXConnect KU Band wifi connectivity onboard its new 787 aircraft. Whether on a laptop, tablet or mobile phone, customers can connect their devices to the wireless onboard internet with just a few clicks and start surfing the web. The cost of the internet is £14.99 for the duration of your flight; however customers can browse destination and aircraft information, Retail Therapy and further Virgin Atlantic services complimentary. With power now available to every seat throughout the 787, customers don’t need to worry about losing battery and can work or play throughout their journey. The 787 Dreamliner sees Virgin Atlantic role out Vera Touch 2 in-flight entertainment system throughout all cabins, boasting over 400 hours of carefully curated, on demand award-winning entertainment. The cutting-edge next generation eX3 system from Panasonic features a widescreen smart monitor at all seats with a capacitive touchscreen interface allowing passengers to access content in just a few swipes and clicks. The IFE also boasts a new Skymap from Betria Interactive delivering a captivating 3D experience, infused with interesting and detailed point-of-interest content that can engage the passenger in a rich and informative interactive experience. All seats boast an integrated USB port allowing passengers to power their own devices. New to the Upper Class cabin is a 24” touchscreen monitor over the bar showing looped animations that complement the cabin environment, as well as the option to view the innovative map on a larger screen. But first let me take a #SkyhighSelfie…. Virgin Atlantic is also introducing the ultimate #SkyhighSelfie, which offers customers the opportunity to update Facebook free of charge from the air. Developed in conjunction with Wavealot, this bespoke application will allow customers to check in on Facebook and share their location with their friends and followers mid-flight. The app will allow one check in per person and customers can purchase the wifi to continue the conversation. Virgin Atlantic is also developing certain #SkyhighSelfie spots in the cabin to offer customers the chance to take the perfect selfie onboard and share their experience. The app will also act as a mile high discussion forum where customers on the flight can chat and spark debate in the air. Atlanta | July 24, 2014– Airlines can now offer their ultra tech-savvy passengers the chance to board their flight with a mere flick of their wrist and scan of their smartwatch. SITA Lab continues to innovate and lead in the area of wearable tech by providing boarding passes for Android watches via its API available now on developer.aero. That right, it’s called THER and we wanted to give our readers a quick first look at some of the highlights. 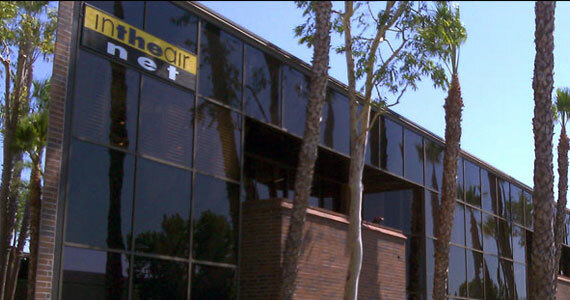 As you may know, Rogerson is really Michael Rogerson of InTheAirNet, Rogerson Kratos, and Equipment Group and many may know of their beginning in the helicopter instrument business. We have followed Michael for years in the IFE business (InTheAirNet) and in the words of their website “InTheAirNet (ITAN) is a global supplier of IFE cabin distribution systems developed thru innovation for airline, business/VIP aircraft with advanced electronics, unique software applications and leading system solutions.” Our story this issue is about a newer product (THER) and we caught up with Michael’s son Mark, Director Business Development who was busily preparing for the Singapore Airshow Singapore Airshow 2014 – Asia’s Biggest For Aviation’s Finest, Feb. 11- 16 Changi Exhibition Centre Singapore. We understand the new THER will be featured there so if you are going, drop by their booth for a preview. This might be a good time to introduce what the acronyms stands for – Transporting Home Entertainment Reliably and in the words of their promotional material, this is the new line of “Personalized Technology” that they have been working on for the last few years. THER offers four distinct passenger entertainment/connectivity preferences: Broadband connectivity, On-board media storage (Audio/Video), “the most popular satellite image map”, and Device Charging. Here is a link to the Android-based product. Like us, you probably are interested in some of the features of the product, and the linked brochure should outline some of the system features. Next, we chased down Mark and sent a list of questions to the busy ITAN marketeers and we have included the answers we got back here… and some were a bit surprising. 1. Q: Mark, many of our readers have not met you, what is your position at Rogerson? 2. Q: Is the THER product a new direction for ITAN/Rogerson? A: Rogerson is continuing to develop new display products for the cockpit and cabin utilizing advanced displays, processors, and innovative software. InTheAirNet’s THER is focused on weight reduction (We are already the lowest), increased wireless efficiency in terms of redundant coverage, and new passenger control units. 3. Q: What system diagrams show the THER equipment list of hardware for an aircraft installation. A: “Please see attached brochures”. 4. Q: Who are customers today for THER? 5. Q: Where can interested airlines find a demo of the THER system? A. “We demo at major trade shows, our own demo room, and our portable demonstration system.” (Editor’s Note: We assume that THER will be shown at the Singapore Airshow). 6. Q: Will THER and ITAN be at Hamburg’s Aircraft Interiors Show in April? 7. Q: Could you outline some future applications that you might envision for the product? 8. Q: Could you give our readers any information about price? 9. Could you give our IFEXpress readers some idea of passenger coverage per WAP? 10. Q: Passenger power conditioning in the server is something we have not seen before – could you address the subject? 11. Q: Any idea about system weight, especially when compared to other systems? 12. Q: What is THER availability today? 13. Q: Mark, could you describe the market as you see it? Next, if you want to dig deeper, Rogerson has included PDF files of the data sheets for the individual LRU’s (WAP, PIP, ANM, ACM, APE, BOB, AIM). And, be sure to introduce yourself to Mark, he is an easy-going, eloquent spokesman for the Rogerson folks and you should see a lot of him in the future! For the past 6 weeks we have been predicting the advent of “wearable” technology in “Predictions” and “Musings” and lo and behold, this week Virgin Atlantic announced their use of Google Glass for interactions with passengers. Count on Virgin to be first, and IFExpress, for that matter! Mobile Boarding Pass, Zodiac RAVE IFE Certification, and Much More! 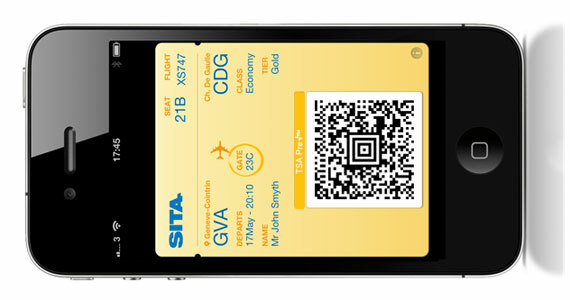 For you mobile device addicts, SITA announced recently that JetBlue is using the SITA Mobile Boarding Pass API for Apple Passbook. JetBlue customers can now simply check-in online and choose to store their boarding passes automatically on their iPhone to use at the airport. Passbook makes it easy for passengers to use mobile boarding passes because it automatically displays the right boarding pass on the passenger’s phone as they arrive at the airport. SITA’s Mobile Boarding Pass API, available from SITA’s API platform, developer.aero, simplifies boarding pass distribution for an airline by allowing them to send passes via email, SMS, push notification and now, Passbook. JetBlue is one of the first airlines to go live using the API and SITA’s technology research team, SITA Lab, is now working with other major airlines and ground handlers to help them offer this service to their customers. We asked Leidar’s Charlie Pryor about device capability and he told IFExpress, “Mobile boarding passes can be delivered to any mobile device. It needs some form of connectivity, typically WiFi or a cell phone network.” Enough said. Check out the opening image for an example of what you can expect on your mobile device. The Federal Aviation Administration (FAA) completed the Supplemental Type Certificate (STC) ST03276CH, which approves the installation of the Zodiac Inflight Innovations RAVE system on the Air Niugini Boeing 767 aircraft. We contacted Global Aero’s Todd Hamblin for a bit more information and he told IFExpress, “The installation and certification was made easy because of Global’s 30 years of experience doing these types of modifications. Air Niugini wanted a cost effective cabin upgrade that would best serve their customers for years to come and Global was focused on bringing it to them. Our engineers and tech’s greatly appreciated the trust and respect Air Niugini gave us during the program and the Zodiac product really puts them in a better position to compete with other airlines in the highly competitive business travel market entering Papua New Guinea. Airlines seeking new IFE equipment need to make sure they select the IFE solution that best fits the needs of the customers but, most importantly, they need to find an integrator that puts the needs of the customer above all others. Finally let me mention that our team is very good at these complex projects because our experience and dedication sets us apart from all others.”…. no sales pitch, we note. For more information, please contact Todd Hamblin at +1 513 444 4049, thamblin@gadc.aero. You know about our love of infographics for conveying information, check out this one on airport IT trends and note if you ask IFExpress the world of apps is upon us and if you don’t carry a mobile device in the future, you could get a surcharge on your ticket! Regarding inflight cell calling, it would not surprise us to find a tekkie frequent flier or two with a cell phone scrambler tucked away for use on a plane. Hey, they exist and are regularly used on buses. Our tech genius has been showing them to us for years! And yes, it is probably illegal. RUMOR CENTRAL – A small flying creature told us that the Row44 folks should probably learn some Mandarin! And finally perhaps, the best safety video ever from Virgin, of course! London, UK | July 24, 2013– AeroMobile, the leading inflight mobile phone operator, has confirmed EE as its latest roaming partner. The move gives EE’s 26 million* customers across the UK the option to use their own mobile phones inflight. AeroMobile already has over 220 agreements with mobile phone operators around the world including O2, Three and Vodafone in the UK. Now passengers using any of the UK’s main mobile operators can make calls, text or browse online at 30,000ft, simply by connecting to the AeroMobile network. So far this year, more than 120,000 UK-based passengers have used the AeroMobile service, sending 175,000 text messages and making 25,000 calls. The AeroMobile service is active on 150 aircraft across nine airlines including Emirates, Etihad, SAS and Virgin Atlantic. All Virgin Atlantic flights between the US and London Gatwick offer the AeroMobile service, as well as selected flights from Manchester and Heathrow. Many flights from the UK to Dubai with Emirates and Etihad’s services from Heathrow to Abu Dhabi also provide AeroMobile connectivity. “Adding EE to our portfolio of roaming partners opens up inflight connectivity to even more UK passengers,” says Kevin Rogers, CEO of AeroMobile. “So far this year, more than 7,000 flights have flown to or from the UK with the AeroMobile service onboard, and we’re adding more airlines and more routes every month,” continued Rogers. Passengers who use the service are billed by their mobile phone operator, and prices vary depending on individual contracts. Prices are typically similar to ‘rest of world’ rates, or in some cases, lower. If you heard about the mayhem in the famous Bellagio fountain last week, the image of Sir Richard Branson riding, or dumping, a jet ski in the water in Las Vegas is probably permanently etched in your brain. The event honored the 10 year anniversary of Virgin Atlantic’s non-stop flight service to Mcarran airport from the UK. As he usually does, Virgin’s Sir Richard, prompted a stunt to mark the event and we will give you some coverage of that madness next issue. The Virgin investment of $2 Billion in new planes and new service from Manchester airport, as well as, the 10th anniversary of the service to Las Vegas, were reason enough for the celebration. The IFE story belongs to Panasonic because of the $70 Million invested by Virgin in the Panasonic eX2 and eXPhone System (via AeroMobile) on 10 new A330’s. The aircraft begin delivery next February, and initially, the hardware will be installed via retrofit. However, Virgin is pressing both Boeing (B747) and Airbus (A330) for future line fit (TC’d) solutions. 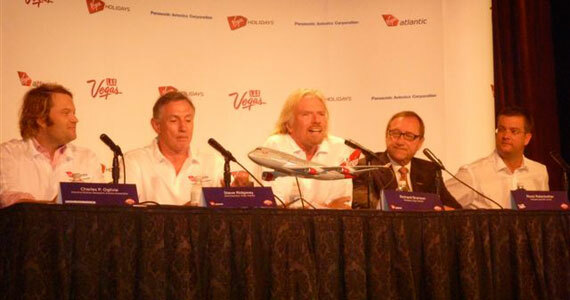 The news conference last week (shown above) brought together Virgin’s Sir Richard Branson – President, Steve Ridgeway – CEO, Greg Dawson – Director Communications together with Panasonic’s Charles Oglivie – Executive Director, and Rossi Ralenkotter – President Las Vegas Convention and Visitor Authority. Obviously excited over the fact that the Las Vegas destination was fourth on VA’s revenue generation destination list, he was very enthusiastic about the Panasonic system. Said Sir Richard, “The possibilities now are unlimited. We want mobile phones to be on silent, but there will be light alerts at the passenger’s seat when a call comes in. We might eventually establish silent zones if need be but we’ll see how things go. This means the business men and women will never be out of touch. Our train riders can add four work hours to their work day when traveling with us by rail. It will be no different in the air.” IFExpress talked to the VA and Panasonic representatives and it was clear that the new non-stop A330’s that will fly from the UK to Las Vegas are an important part of both the Las Vegas growth plan and the future of Virgin Atlantic. The “take-away” here is that Panasonic is actively engaged with Virgin Atlantic today to bring their whole suite of phone-TV-Internet services to the aircraft – initially via Inmarsat and eventually via their broadband network. Paul Margis told IFExpress that they presently have consigned Ku-Band transponders in their network that cover the world routes and planes are operating with the capability today. It is obvious that Sir Richard is a fan of technology as he noted passenger preference for using connected devices; “Passengers will be able to email, make phone calls, use their iPhones to talk and text message.” Virgin Atlantic’s existing fleet of of 33 wide-body aircraft have to look pretty good to Panasonic and we expect that the negotiations are underway to upgrade their whole fleet. Time will tell. Editor’s Note: Be sure to check out the Aeromobile release in this issue of IFExpress and here is more about Panasonic and Virgin Atlantic as well as the latest release from Panasonic.